Designed for clarity at a wide range of distances and refreshing comfort all day. DAILIES® AquaComfort Plus® Multifocal contact lenses combine the best of both worlds—Precision Profile design for clear vision and blink-activated moisture for refreshing comfort all day. A full range of prescription strengths blends seamlessly for instant focus and smooth transitions across a wide range of distances. Whether it’s reading a restaurant menu or your favorite book, you can start seeing comfortably again within arm’s length, without eyestrain. And only DAILIES® AquaComfort Plus® brand contact lenses have blink-activated moisture for outstanding comfort throughout the day. People who have presbyopia (inability to focus on near objects who may currently use reading glasses) and aren’t currently wearing contact lenses or are dissatisfied with their current contact lenses. Don’t blame yourself for your monthly contact lens discomfort, it could be your lenses. As the month goes on, you might be using rewetting drops, taking breaks, or removing your lenses to deal with the discomfort. If this sounds familiar, NEW ACUVUE® VITA® Brand with HydraMax™ Technology might be the right lenses for you. 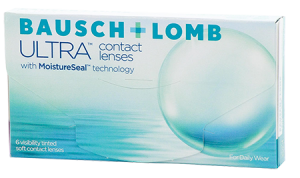 Monthly contact lenses designed for reliable, superior comfort. New ACUVUE® VITA® delivers on weeks 1, 2, 3 and 4 by maximizing and maintaining hydration throughout the lens. 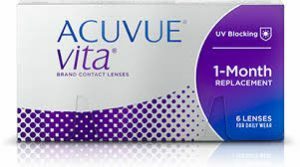 ACUVUE® VITA® lenses are available in 6 lenses per box. HydraMax™ Technology helps maximize and maintain hydration throughout the lens—providing lasting comfort throughout the month. 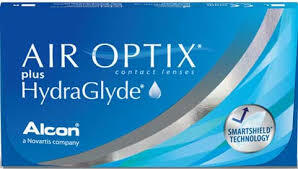 AIR OPTIX® plus HydraGlyde contact lenses support a comfortable lens wearing experience. 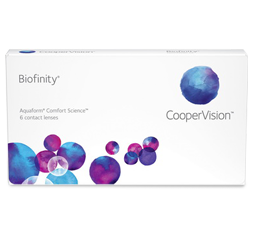 Thanks to our exclusive Aquaform® Technology, Biofinity lenses allow plenty of oxygen to pass through to your eyes. And their natural wettability won’t rinse off. You’ll enjoy excellent vision with a soft, comfortable lens that’s healthier for your eyes. Learn more about Disposable Contacts. MoistureSeal Technology Maintains 95% of its moisture for a full 16 hours. With MoistureSeal technology, your contacts feel comfortable – even at the end of the day.